I read somewhere recently that 'your time is communal“. Fascinating idea. Whether married, single, dating or whatever, the time you have is communal. It is actually owned by many, it is not your own. We all have people in our lives that are important to us, whether family, friends, work colleagues. And what comes with the territory of this is that they take up time, they demand time of us. This is ok, if we were to not give others our time we'd be missing out on a massive chunk of what life is all about. So when we are trying to pursue something of our own – an idea, a new business venture, a new hobby that we do alone, a 'side project', our private devotional times with God- it can be really hard to find the time to do it. We find that days, weeks, months, years even can go by without us doing anything because we have not factored in the time to do it, we feel that we simply don't have the time. 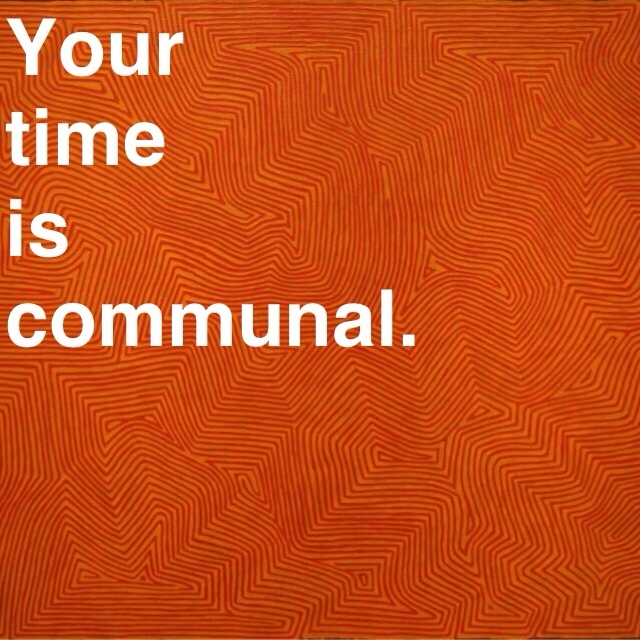 in many ways you're right, we don't have the time, because time is communal. However, we can find some time that is not communal. Right now. I'm keen to write blogs when possible. I'd hate to do this when I first get home from work, because I want to spend time with Heather (my wife). But in the morning, nice and early I tend to wake up before she does, and this is a perfect time to write blogs, because she does not feel like I'm cheating her of her time. When does that time come for you? Saturday mornings? 5am during the week? 11pm during the week? Sunday nights? Find a time that works best for you, and best for the others who own your time, and make your side project/devotional time/hobby/new business happen. ← How to approach strangers.